Checking your tires regularly (once a month) for damage or uneven tread wear will let you get the most out of your tires’ life. Incorrect tire pressure, misaligned wheels, unbalanced tires and suspension problems will hinder your tires’ performance and jeopardise your safety. Check the pressure of your tires regularly (the correct tire pressures can be found in your vehicle’s manual). Always check the tire pressure when tires are cold. It is normal that tire pressures increase while driving. Rotate your tires every 10,000kms. Check your tires tread and sidewall regularly for cuts, deformation and uneven wear. Have your wheels aligned every two years or if you suspect that the vehicle’s suspension has been damaged. Always have your wheels balanced when installing new tires. Replace your tyres when the tread has reached the minimum depth point which is located in the tread. 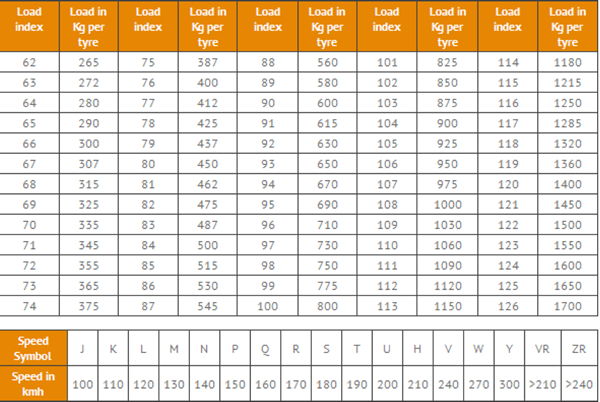 The Load Index shows the maximum weight each tire can hold. The Speed index shows the maximum speed a tire can drive. Tires with Run Flat technology have a reinforced sidewall which helps the tire not to get squeezed to the rim when deflation occurs. This allows the vehicle to drive at a maximum speed of 80kms/per hour for a distance of 80kms depending on the road and the vehicle conditions. Why chose new tires over used tires? New tyres offer more than just optical benefits! They provide improved safety through the full tread depth. New tyres are often quieter and give a more comfortable ride. New tyres are checked very thoroughly by the manufacturer, ensuring optimum safety for you and your vehicle. Used tyres are often dangerous. It is almost impossible to know the history of the tires, what the tyres have been subjected to, or whether the interior was damaged, for example, through harsh driving over kerbstones.